You hear it every day; the price of flower is dropping because of simple economics; supply is outpacing demand. What is the commercial cultivator to do? The only way to grow their way out of it is to invest in best practices and become as efficient as possible. It’s all about ROI these days and we are not talking about Return On Inhale. 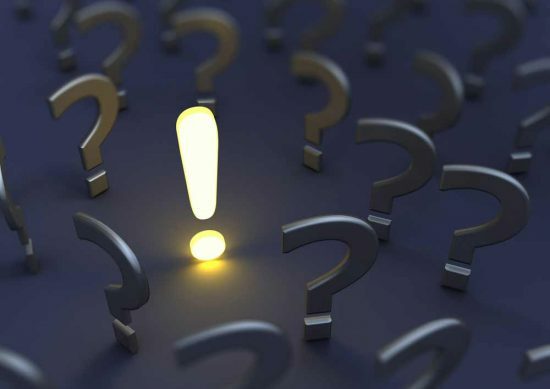 Below are the features to look for when you are looking for a grow light that will escalate your commercial cultivation ROI, return on investment. First, let’s talk about the quantity and quality of light. You want a high frequency, high performance ballast with the best-of-the-best semi-conductors on its printed circuit board. Look for a ballast that operates at over 120Hz. Operating at this high frequency generates the cleanest, highest yielding light. Not only does this high frequency deliver the best quality light, it also efficiently manages power consumption. (Meaning if you are going to pull amperage from the grid, you may as well get the most use out of it!) The high-quality semi-conductors optimize the power draw and decrease the electricity bill for the commercial cultivator. The highest-powered grow lights are sold at 1000W but the best quality, high frequency ones can push above 1000W. At the high end of the spectrum, the DimLux 1000W DE “boosts” to 1200W! 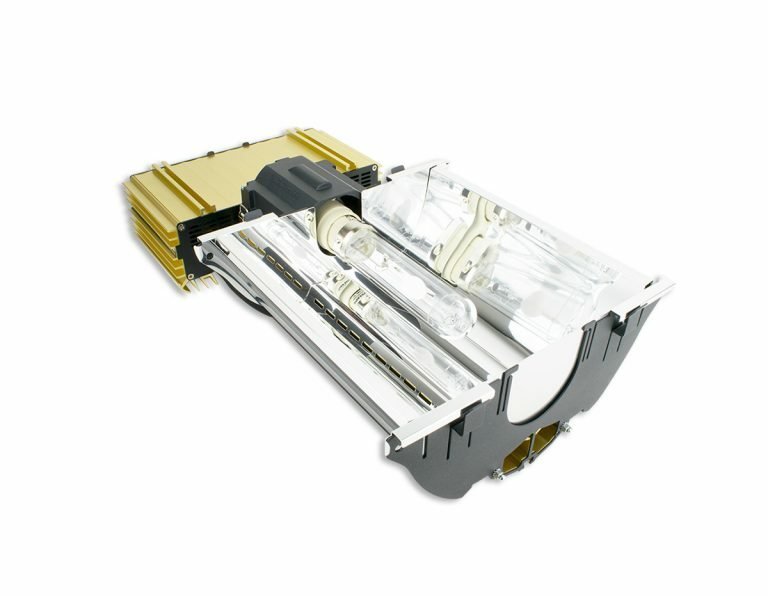 DimLux 1000W DE fixtures ship with the Philipps GreenPower bulb that can be pushed to 2245umols at 1200W. This is the highest umol output for any 1000W HID fixture in the marketplace. This is a ton of light and can actually cut down on the number of fixtures in a commercial cultivation light plan, which means greater ROI from the beginning. Not only do lamps in boost mode at 1200W generate more light, they last longer and skew more to the red side of the PAR spectrum. More red means more flower production which ultimately means an ROI escalation…and we all like that. Next, let’s consider heat management. You need a fixture that can manage heat effectively to cut down on the amount of cooling and HVAC expense in the grow room. The exterior of the fixture should be designed for efficient heat dissipation. When you pick up a fixture, make sure the heat slats are generous enough for effective heat dissipation. Pay attention to the angle of the heat slats and if they are oriented for maximum heat management. Next, inspect a fixture for how it manages heat inside the reflector. Make sure there is a way for the reflector to allow heat to leave the area surrounding the bulb. If the reflector is not designed properly, heat will build up around the bulb and decrease the umols generated that will strike the canopy. 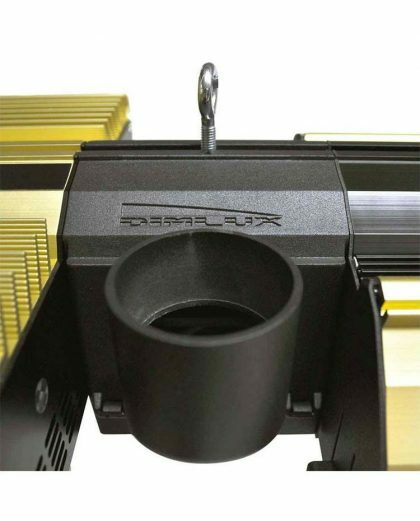 On the DimLux fixture for example, there is a 2” port at the top of the reflector that allows passive heat dissipation. Heat created from the bulb rises through the slats on the inside of the DimLux miro silver reflector, and then funneled out through this 2” port. Another key feature in a grow light that will escalate ROI, is Single Bounce Clear Sight (SBCS) technology. With Single Bounce Clear Sight technology, the light created by the lamp point source only bounces off the mirror silver reflector once before striking the canopy. This one bounce greatly reduces heat build- up beneath the lamp which allows this type of fixture to produce the highest number of photons of any grow light in the industry. Other dimpled aluminum reflectors gather heat below the lamp point source and restrict photons because light is bounced 3-4 times within the reflector before striking the canopy. This is why dimpled reflectors produce much fewer quantity and quality of light compared to their miro-silver brethren. Finally, when choosing a grow light to escalate ROI, choose a light system that is environmentally driven. Look for a grow light that integrates with a controller and environmental accessories like temperature, humidity and CO2 meters. Always think photosynthesis and plant happiness. Like people, plants that grow up in a stable and comfortable environment produce the best results. Temperature and Humidity play a crucial role in plant growth and vigor. Make sure the grow light you choose has temperature and humidity sensors as partners in comfort for your plants. Vapor Pressure Deficit (VPD), is the hottest term and concept right now in cultivation. By knowing and controlling VPD, the commercial cultivator can optimize photosynthesis. Optimizing photosynthesis escalates ROI. Make sure your grow light’s controller can calculate and display a VPD reading. It has been proven that CO2 can increase final flower yield by 20%. Use a CO2 sensor to monitor the correct of CO2 needed for optimum CO2 uptake. The DimLux grow light system incorporates the best in class controller, the Maxi Controller, the Temperature Sensor, Humidity Sensor, Plant Temperature Camera, and CO2 sensor to effectively manage and control the total environment in a grow room. And more control, more optimization, means more ROI. We’ll close by advising you to choose well, choose wisely, choose the grow light that will escalate your ROI and yield the best product of your cultivation career.